At the beginning of the 2017-2018 school year, every student from grades 9-12 received Chromebooks from the Iowa City Community School District as part of the district’s One to One initiative. “Most schools were going in this direction, so the district realized that this was going to need to happen,” said City High principal John Bacon. As part of the switch, Bacon says the district underwent a comprehensive infrastructure upgrade, increasing things such as internet bandwidth– the amount of data an internet connection can transfer at any given time. 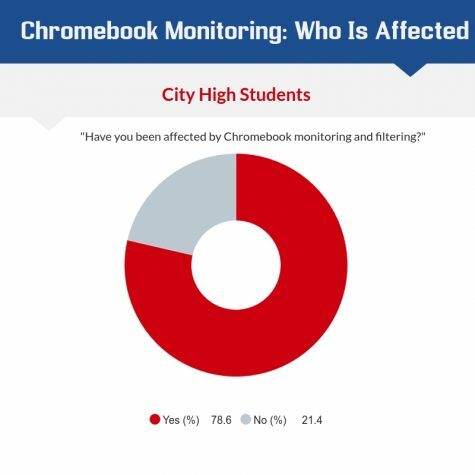 They also had to determine what type of security measures to implement so that content would be appropriately filtered on Chromebooks. Securly’s filtering system is based on a large selection of keywords. Some keywords, by federal law, are required to be checked, and some are a matter of district philosophy. “We talked to the district legal counsel to help us with the legal aspect of filtering in a 1:1 program, and then we decided individually which sites we want to block. Some example of things we chose to block are apps such as Snapchat,” Mr. Kurth said. However, some students have reported that some websites have been blocked that they believe are completely appropriate for school. “I take a medical class and I’m not able to look up certain terms because they are blocked,” one student answered in a Little Hawk survey about the new security measures on Chromebooks. “Multiple educational Youtube videos were blocked. I checked them on my phone, and there was nothing wrong with them– no swearing, violence, drugs or [similar things],” another student replied. Kurth says that incidents like these will be looked at by the district, but may not be possible to fix because websites are blocked on a keyword basis. In addition to these security measures, parents are sent an email every month containing websites and keywords their student has searched or visited. One student who wished to stay anonymous felt as if high school students should be in control of their own safety. “It is completely wrong. We are high school students who can handle whatever we see online,” they said. In addition to neither students nor parents explicitly signing up for this service, students were never notified that their data would be collected. This non-communication is one of Kurth’s biggest regrets about the program. “Honestly, if I could change one thing about our 1:1 rule that would be it,” Kurth said. Privacy has long been an issue with districts who switched to 1:1 programs. In Rhode Island, the Lower Merion School District was found to have taken over 50,000 photos of their students using their school owned computers’ built in camera’s. An EFF (Electronic Frontier Foundation) study found among a study of 1000 school system members that “45 percent of parents reported that their schools or districts did not provide parents with written disclosure about ed tech and data collection”. That same study also found that 57% of parents responding to the study were “completely sure they had not received written disclosure about their school’s ed tech practices”. ICCSD broke this trend, as parents with a kid in any district high school were notified about this email before the school year started. “I believe we were sent an email by Mr. Bacon, and then by the district about these emails,” said Izaskun Lejarcegui, parent of City High student Bihotza James-Lejarcegui ‘18. Post implementation, Mr. Kurth wishes that the amount of communication between the district and students could’ve been more distinct and frequent.